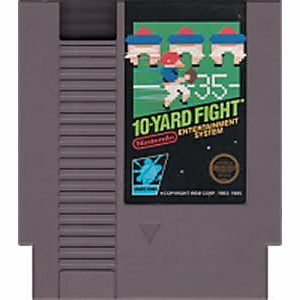 10 Yard Fight original NES Nintendo Game cartridge only - Cleaned Tested and Guaranteed to Work! I played this way back when I was a boy. I had a great time with it then and still brings me back when I played it again. You need a little patience while playing it. Superbowl here I come. Thanks Lukie Games. 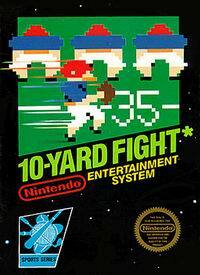 This is a simple, but fun football game for NES. Not as flashy as Techmo Bowl, but still fun. 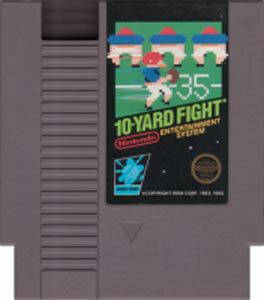 10 Yard Fight is an American football game made by Nintendo. Being one of the first football games on the system, it leaves a lot to the imagination. The games move very slow, and it almost seems unplayable at times. Cool to own because alphabetically it's the first NES game. I say that this is my ninth favorite sport game on the NES.